Greg is a musician with a background steeped in the Great American Songbook. He played for fifteen years with Jimmy Hamilton, one of the greatest clarinet and saxophone men of The Duke Ellington Orchestra. Jimmy taught Greg a repertoire of classic ballads and swing tunes that are the very greatest of the 20th century. Greg also learned western swing and classic country songs while growing up as a young professional musician in Wichita, Kansas. Greg’s experience has been widely varied. He has played shows accompanying classic 50’s and 60’s Rock and Roll, Doo Wop, Soul, and Blues performers like: Little Anthony and The Imperials, The Shirelles, Cab Calloway, and The Coasters. 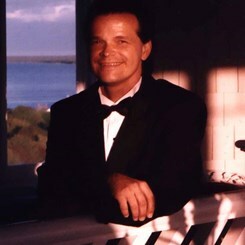 While playing for four consecutive seasons at the Grand Hotel on Macinac Island, Michigan, Greg nightly performed solo piano/ vocal shows which featured the music of the great artists of the 1920’s, 30’s, 40’s, 50’s, and 60’s. While playing for Jimmy Hamilton he lived on St Croix in the US Virgin Islands where he also picked up the Reggae and Calypso classics and the great dance styles of Mexico, South America, and Cuba. In other words Greg enjoys playing wide variety of great popular music and likes to treat his listeners to their favorites from Sinatra to Belafonte and from Bill Haley to the Beatles. Greg teaches lessons across the entire percussion family including drum set, snare drum, marching, and mallets. Request Lessons with Greg today!